I have this friend. I haven’t known her long…only a few months…but I feel like I know her well. We connected, she and I, in that way that is a rarity. That way that makes you question how long it is exactly that you’ve known each other. Surely years have passed, but when I think back to where I was just 6 months ago I realize that this friend didn’t know me then. When I consider all the emotions, all the questions, all the crazy I’ve experienced over the last 2 years and then stop and think about how I didn’t even know this person during most of it I am flabbergasted. And then I consider the here and now. How topsy turvy my life currently is. And I look at my friend. She had every reason to bow out when we met those few short months ago. My life was about to get hard. Why would any sane person choose to have a front row seat to chaos she just learned existed? But my friend, she didn’t bow out. She stepped up. She chose to walk beside me and hold my hand. She is my steady. My constant. A safe place to land after a hard day. I’ve debated sharing her with you and decided I can’t keep her a secret. When I first met her I noticed that she wore a chain around her neck with two charms on it. One of those charms is a Fleur-de-lis. She explained it’s significance over dinner the first night we met. As I thought about what to call her here, at least for now, I thought that Fleur-de-lis was perfect. It’s an emblem that can be political, but at the same time is a beautiful flower…a lily or an iris. It’s artistic and regal. It’s been on flags, coins, coats of arms, and in various artwork all throughout history. Old and new people groups have used it for various purposes which makes it meaningful and versatile. 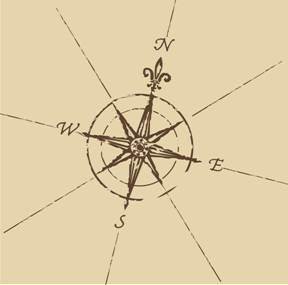 My favorite thing about it though is that it is often used on a compass rose to mark north. And if you know where north is you can’t ever get lost.